Facebook, despite the troubled reputation due to the recent psychological experiment on users and the degrading grip on privacy, tops the list of social media marketing. No one can deny the behemoth hold it has over the entire digital marketing force. You may blame it on the huge global userbase Facebook already has. 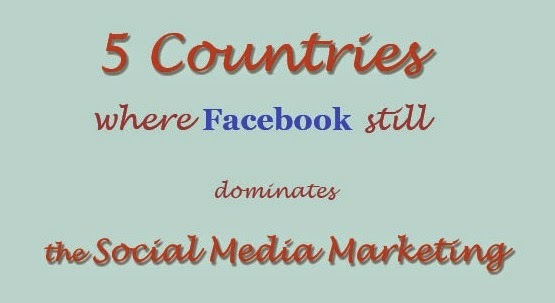 Here, in this social media infographic, I would like to stress on 5 countries (US, UK, UAE, Brazil and India) where Facebook dominates the social marketing area with its constantly growing userbase. Though the base considered for this infographic is of Top 20 Brands and their fans, yet it is a general assumption where we consider fanbase as a constant and the brand as a variable from the mathematical point of view. If you take a close look into the infograph you would notice that the twitter fanbase is decreasing for 60% of the countries for all the brands over the period of last 6 months. Interesting! In the coming time, twitter may become the most used channel for content publishing for all the brands concerned, but eventually brands are losing their twitter fan base in the first half of the current year. On the other hand, Facebook fan base is constantly growing everywhere. So, the brands must fly the blue bird cautiously ahead!